a spectacular site specific circus/physical theatre show, in, around and above the pool. 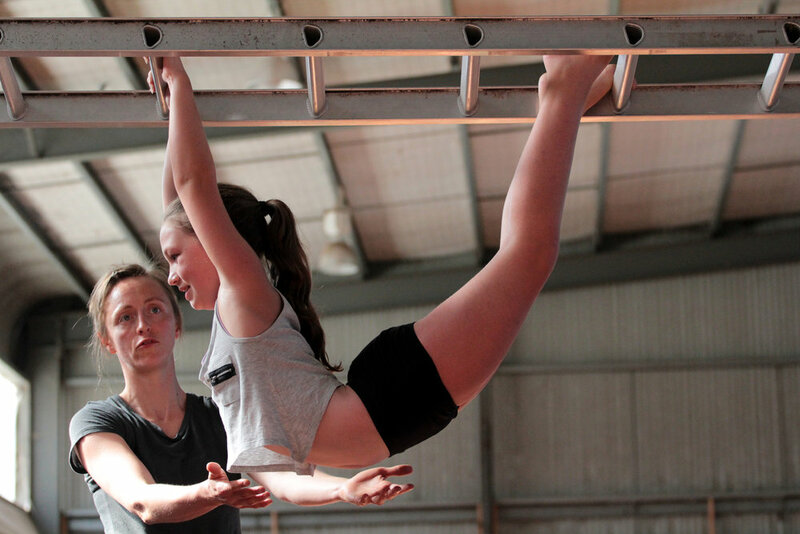 After a short pilot in the the summer of 2016/2017 ASKING for TROUBLE and RUSSELL:EVANS collaborated again in the summer of 2017/18 to create a spectacular site specific circus/physical theatre show, IN THE DEEP END, in, around and above Clunes pool with an ensemble of 24 young people. Performances were presented at Clunes and Trentham pools in late January 2018 followed by Newstead pool as part of Waterhole (a Regional Centre for Culture event). IN THE DEEP END is a show inspired by the local pool and the element of water. It explored a space that is a meeting place for play, physicality, self-awareness and self-consciousness a show celebrating a community space which is rich with stories and imagery. The soundtrack included voices telling stories of experiences from very young children to the elderly, who remember playing at the pool through many eras of their lives. The young people who were involved in this project gave up a large chunk of their school holidays to train and create the work. This process has led to us passionately pursuing the possibility of an ongoing Clunes based youth physical theatre company creating high quality and tourable work.